Shaping basically just means that you are going to use a series of steps to teach your dog to do a new behavior. By breaking the behavior into easily-achievable steps, your dog will feel successful during the training process. This will also speed up learning and reduce confusion and frustration! Most importantly, as your dog learns more and more new behaviors using shaping and positive reinforcement, he will start to enjoy learning new things and will look forward to interacting with you during training. Here’s a simple example. Imagine you want to teach your dog to voluntarily go into his crate when you say “Go to your crate.” You could first reward the dog for approaching the crate and putting one foot in the crate. After working on this for a bit, you could then reward him for getting halfway into the crate. Later, you could wait for him to get all the way in the crate before giving him the reward. Finally, you could reward him when he gets all the way in the crate and then lies down. A trainer would say that the dog has been “shaped” to get into the crate. Often with simple behaviors such as sit, the trainer expects the animal to do the whole movement from the beginning. However, it can be difficult or impossible to require the animal to do the whole behavior from the start for more complex behaviors or behaviors that involve a longer sequence of responses. Shaping gives the trainer a way to communicate complex tasks to the animal. It also increases understanding because the trainer breaks the behavior into small, achievable tasks that are taught one step at a time. Great shaping is both science and art. Trainers who have shaped lots and lots of different behaviors are often able to train new behaviors quickly and with very minimal errors. They are able to set up the training so that the animal can be happy and successful at every step of the process. In this post you’ll learn about the formal definition of shaping, questions to think about before you start shaping a new behavior, and why shaping sometimes doesn’t work. I’ve also included a dozen great examples of shaping in Part 2. The differential reinforcement of successive approximations toward a target behavior. In plain English, this basically means that you start by reinforcing (rewarding) little pieces of the behavior, and gradually build up the behavior until you reach your final goal. However, let’s break this down and look specifically at each of the major elements in the definition of shaping. Understanding each of the three core elements will help you when training your dog and when designing your own shaping plans. Target behavior. Your target behavior is your final goal. It’s what you want to achieve as a result of the training process. You’ll want to make sure you have a clearly defined target behavior before you start training. This means thinking through exactly what you want the dog to be doing, what situation(s) the dog will do the behavior in, what cues you’ll use, and any other particulars. For example, perhaps you are worried about your dog running out the door when visitors come over. So, you decide you will teach him a really solid stay. However, saying “I want my dog to sit and stay and not run out the door” isn’t nearly precise enough! Exactly when and where do you want the dog to stay? In order to effectively solve this problem, you’ll want to be specific regarding when and how the dog should do the behavior. So instead, your target behavior might be to have your dog go to his dog bed in the living room when the doorbell rings and then stay lying on his bed while you open the front door to collect a package or let a visitor into the house. See how this is much more precise than the goal in the previous paragraph? Successive Approximations. The successive approximations are the baby steps you will use to train your target behavior. Rather than starting with the final behavior, you will start by rewarding approximations to the final behavior. Each step, or approximation, will take you closer to your goal. For instance, did the previous example of teaching the dog to go to his bed when the doorbell rings seem impossible to you? This is a behavior that would be pretty difficult or even impossible for a lot of dogs! However, by breaking the behavior into a series of smaller, achievable steps, it becomes much easier to teach. Some people are skeptical about shaping. They think that it will take a lot of time to train a behavior, if they have to break the behavior down into lots of little steps. However, the reverse is usually true. Small steps actually make the training go faster because the communication is clearer and the animal understands exactly what to do. Differential Reinforcement. The basic process that keeps shaping going is reinforcement. Every time the animal does the right behavior, the trainer follows this with something that the animal likes, such as a food treat, a belly rub, the chance to chase a ball, or anything else that the animal finds rewarding. The trainer knows that reinforcement is occurring if the animal continues doing the behavior and actually does the behavior more frequently. The interesting thing about shaping is that there are always some behaviors being rewarded, and other behaviors that don’t earn rewards. This is the process that behavior scientists and psychologists call differential reinforcement. Back to the example with the dog bed. If your dog has not been previously trained to go to his bed on cue, you might start by giving him a treat any time he puts a foot on the bed. Since you have his favorite treats and you start by standing right next to the bed, he figures this out fairly quickly. Pretty soon, he understands this step and is repeatedly offering to step onto the bed with his front feet. Every time he does this, you reinforce the behavior by giving him a treat. So, you go on to your next step (your next approximation) and now only give him a treat if he puts all four feet on the bed. If he only steps on the bed with his front feet, he no longer gets a treat. Even though this behavior previously earned a treat, it doesn’t any more. Your pup starts experimenting a bit, and it doesn’t take long for him to catch on to the new requirement. Now he is going all the way onto the bed each time. Once he is doing this reliably, your next step might be for him to go all the way onto the bed and then lie down. For this step, standing on the bed would no longer earn a reward, but lying down would. At each step, the approximation you are currently working on will earn reinforcement. If the dog offers behaviors from previous steps or completely unrelated behaviors, these won’t earn reinforcement. As a result, the behavior that is earning reinforcement increases in frequency, until the dog is spending most of his time engaged in this behavior. The other behaviors that aren’t earning reinforcement don’t happen as often or disappear entirely. This is the process of differential reinforcement. The trick with shaping is to divide the behavior into the right steps so that every time you move to the next step, it is very easy for the animal to figure out the new requirement. If the steps are too big, it will be too difficult for the animal to figure out what you want when you move to the next step. This can lead to frustration and confusion, because the animal will be attempting different behaviors, but not getting reinforced often enough. Designing the right shaping steps is the topic for another blog post (or even a whole book…. ), but for now I want you to just remember that with a good shaping plan, it should be very easy for the dog to succeed and it should not be difficult for the dog to figure out what you want at each step. If the dog is offering a lot of extra behaviors or unwanted behaviors or can’t figure out what you want, you’ll need to add in some intermediate steps or even rethink your whole plan. That first part was a lot of words, wasn’t it? This next section includes some video examples of shaping so that you can see how it actually works. With a skilled trainer and an experienced dog, a new behavior can sometimes be shaped incredibly quickly. However, if you are new to shaping, it can be difficult at first to determine how to teach a behavior and what behaviors you should and shouldn’t reinforce. Becoming a great shaper takes time and practice, well-developed observation skills, great timing, good planning skills, and being able to predict what the animal will do next. One way you can learn more about shaping is by watching others. As you watch these videos, pay attention to what steps (“successive approximations”) the trainer uses to train the behavior. Does the trainer do certain things that make it easier for the animal to figure out the correct behavior? What behaviors does the trainer reinforce (and what behaviors does the trainer not reinforce) at each step? In this video, my mother’s dog, Ginger, learns how to lower her head using shaping. This was the second day we had worked on this behavior, so Ginger understood that the objective was to lower her head. You’ll see that she experiments with how far she needs to lower her head and that I wait for a little bit more behavior each time. This is just a silly trick, but it is a very nice example of shaping! Notice how the trainer (Kat of KatsDogs) gradually shapes the dog to lower her head farther into the bowl, and also to hold her head in the bowl for longer durations of time. All the while, she is gradually adding more water. 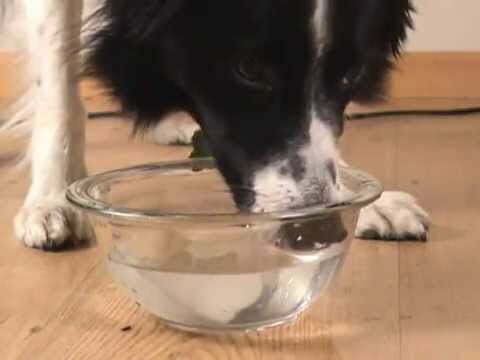 Observe how at the beginning Kat is purposeful about reinforcing when the dog has a closed mouth, and not when the dog is licking the water. This video also has a nice example (around the one-minute mark) of how the placement of the food can be used to encourage the behavior in the correct direction. Here’s a fun video from Emily Larlham, aka kikopup. 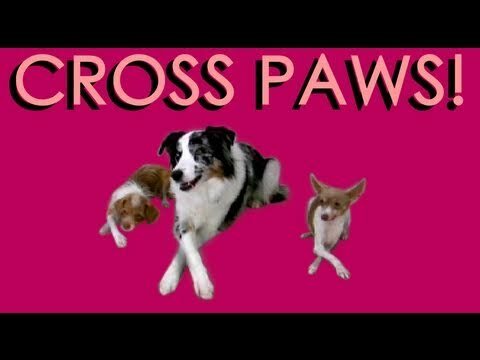 As you watch the progression of steps in this video, you’ll see how the trainer initially gets the paw movement and then uses a series of steps to gradually remove the object. This video also discusses how it can be helpful to momentarily go back to a previous step if the dog gets confused. Most of the examples so far have involved tricks. 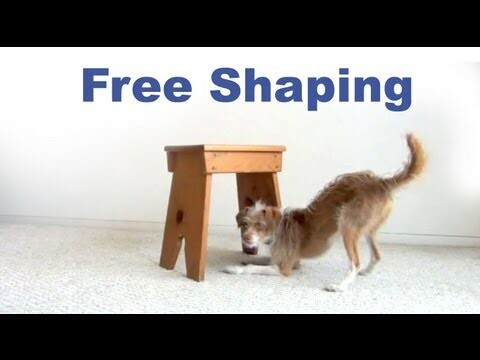 However, shaping can be used to teach your dog just about any behavior! In this video, dog trainer Sarah Owings shows how a previously shaped behavior (relax on a mat) can be expanded to teach a puppy to sit quietly next to her while she puts on her shoes. This is a difficult behavior for a young pup! Notice how Sarah continues to reinforce often to help the puppy succeed and to let him know that he is doing the right thing. In future sessions, she would be able to gradually reduce the number of treats given. This is a very interesting shaping example and perhaps one of my favorite YouTube videos. Watch closely the sequence of steps in this video from British trainer Kay Laurence. It is a rather unconventional way to teach “go to a mat,” but very effective. Rather than rewarding the dog for getting closer and closer to the mat, watch how the trainer (Helen) starts instead without using the mat at all. 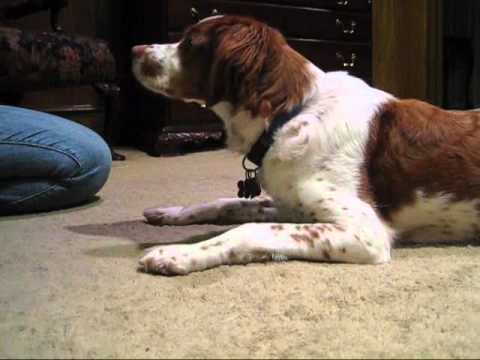 In this video by Donna Hill, the dog is learning to touch her shoulder to the trainer’s hand. Donna trains a lot of service dogs. 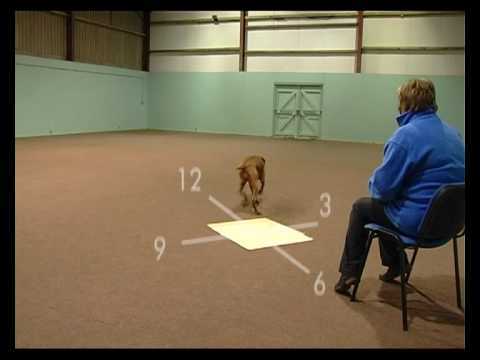 This task teaches the dog body awareness and can later be used to teach more complex behaviors. Watch the different behaviors the dog offers. At the beginning, the dog offers some backing up. Through careful reinforcement, Donna is able to communicate the correct behavior to the dog. Here’s another video from Emily Larlham. In this example of shaping, the dog is learning how to crawl under an object. The first dog in the video illustrates nicely how learning can happen very, very quickly when the dog has a lot of experience with shaping. Notice how Emily makes the behavior easy at first for Tug by using a tall object that he can go under easily. With shaping, anything is possible! We’ll end with an example of a very smart pup. This video shows the progression of shaping steps that were used to teach a poodle named Chase to perform a matching task. Chase learns how to look at an object and then find the object on the table that matches the one that the trainer is holding. This video was the co-grand prize winner in the 2011 Canis Film Festival. Of course, dogs aren’t the only ones that get to have all the fun! Here are four more shaping examples with some other types of critters. With positive reinforcement and shaping you can teach most any behavior to most any creature, as long as the animal is physically able to do the behavior. Many people will falsely tell you that cats can’t be trained. This is certainly not true! However, it can take extra patience sometimes, depending on your cat. This video is a nice example of shaping, again from Kat of KatsDogs. 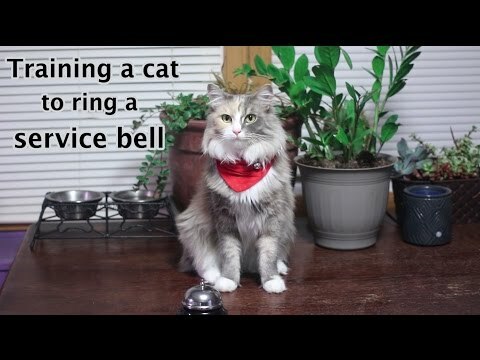 Watch how the trainer starts by reinforcing any paw movements and then gradually focuses in so that the cat only receives reinforcement when she hits the top of the bell and makes it ring. When my friend Maasa adopted Jackson, he was very skeptical about having a halter put on. He would even walk away if someone tried to approach him with a halter. Maasa didn’t just want to teach Jackson to stand still while she put on his halter. Instead, she wanted to teach him to actively participate in the process and to enjoy having his halter put on. This video is a bit longer, but it does a nice job of showing all of the shaping steps that were used to train this behavior. In this shaping example, you’ll see the series of steps that I used to teach Amy to raise a bucket to get a tasty treat. I start by teaching her to eat a treat from the bucket and then to pull up on the bucket. Next, over a series of steps, she gradually learns to pull the bucket longer distances. At one point, I make it too hard and have to go back to an easier step. Amy eventually learned to pull the bucket from quite a distance! Here is a short video clip of the final behavior. Question 1: Where are you going? / What behavior do you want to train? This might seem too basic, but this is the all important question. Where are you headed? What behavior are you wanting to train? Before you begin training, you should spend some time thinking about what you want the final behavior to look like. What will the animal be doing? How will the animal move and act? What should be the animal’s energy level and emotional state while doing the behavior? What cues will you use? 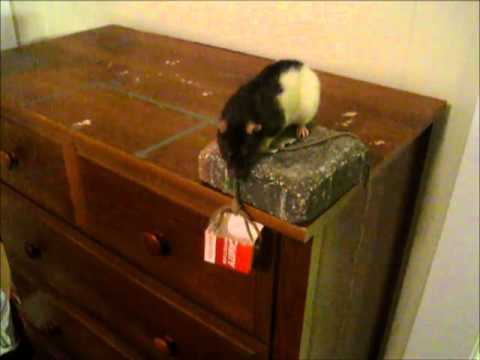 In what settings will the animal do this behavior and what sorts of distractions might be present? Consider these questions before you begin. I would even encourage you to jot down the answers on a piece of paper. It is really easy sometimes to think of an idea and want to run off to go start training before you’ve really fully thought through the idea. If you do not have a clear goal, you will often find that the behavior you end up training is not quite the one you originally imagined! Question 2: Where are you now? / Where will you start? Once you work out your goal, you’ll also want to spend some time thinking about where exactly you and your dog are now. A nice analogy for this relates to getting directions before you leave on a road trip. In order to get directions, you need precise information about both the location of your final destination and about your starting point. Instead, consider “Where am I now” from a positive perspective. Sure, you dog doesn’t know how to bow, but he probably knows other behaviors. What behaviors does your dog already know that will help you when training this behavior? Can you start with one of these behaviors? Perhaps your dog knows how to stand in front of you and make eye contact. You might start with this and then gradually reinforce when your dog lowers his head or his shoulders, until he is bowing. As you consider where to begin, remember that shaping will work best if you begin with a behavior that your dog already knows or that your dog will be able to do very easily. This will help the dog be successful at the very beginning. Now is the time to also consider if there are any pre-requisites that you might want to spend some time reviewing first, or if the dog is lacking certain pre-requisite skills, you might need to teach these first. Question 3: How will you get there? / What will be the steps of your shaping plan? Before you start training, you will want to have a well laid out plan of how you think you will train the behavior. You will want to consider how you will progress toward the final behavior, the different steps you will use, and how you will decide when to move on at each step. While it’s important to have a solid plan, it’s also important to remember that you can change your plan! If something is not working, stop training. Try to figure out what is going on, and then, adjust your plan as needed. If you find that you are repeatedly getting stuck, take some video and review it yourself or have a friend review it. Also, it’s important to remember that there is almost always more than one “right” way to train every behavior. Some ways you will want to avoid because they involve force, coercive training methods, corrections, or intimidation. However, don’t get stuck because someone tells you that there is only one right way to shape a certain behavior. If your shaping plan isn’t working, see if you can figure out a completely different way to approach it. Question 4: What will keep it going / What will maintain the behavior? When your dog chooses to do a behavior, he is motivated by one of two reasons – he acts to gain access to something he wants, or he acts to avoid or prevent something that he does not want to happen. If this idea is new to you, think about your dog’s natural behavior throughout the day. He whines at you when he’s hungry and wants breakfast served, paws at the door to go outside to go potty or chase squirrels, walks a wide path around the big armchair when the cat is sitting on it, naps by the window so he can catch the afternoon sun, and brings you a ball when he’s ready to play. Clicker trainers and positive reinforcement trainers stick to the positive motivators – they use things that the animal is eager to work for as motivation, rather than relying on corrections, coercion, physical force, or other unpleasant means of motivating behavior. So, what will make your dog really want to do the behavior you are planning to train? Trainers often use food treats because most dogs like them. As well, the dog can consume a small treat quickly, and then get back to the next behavior. However, there are lots of other options – getting to play briefly with a tug toy or chase a ball, getting petted or scratched, and more. Really, you can use anything, as long as it gets your dog excited and he is willing to do behaviors in exchange for it. You’ll want to consider the reinforcers (rewards) you will use during training and whether this will differ from the reinforcers you want to use to maintain the final version of the behavior once it is completely trained. For the final version of the behavior, your reinforcer might take a different form. For instance, imagine training your dog to sit and wait patiently while you open the back door. Initially, you might shape this behavior using treats. However, later on, you could use a more “natural” reward, such as getting to go outside and play or getting to go on a walk. Or, you might teach your dog to do a new trick and use playing with a tug toy as the reward while shaping the behavior. Later, you might incorporate this trick into a larger sequence of tricks, with one big reward at the end. Shaping is a very powerful training tool. However, it isn’t always easy. It takes time and practice to become good at shaping and, even then, things sometimes don’t go as planned. You are working with a living, breathing creature, after all! When something doesn’t work, it can be easy to get frustrated and to want to give up. Instead, however, spend some time analyzing what happened and trying to figure out why things didn’t go as planned. This can often lead you to a new way to approach the problem. Here are half a dozen reasons why shaping sometimes doesn’t work. If you’re having trouble shaping a behavior, consider if one of these reasons applies to your training. 1) The animal (or trainer) lacks certain essential pre-requisite skills. Training plans often fail because the animal is missing necessary pre-requisite behaviors. If this is the case, the trainer has to figure out what behaviors are lacking and go back and teach these. For example, if your friendly dog does not already have a very solid stay, he will probably struggle if you try to teach him to stay sitting at your side when a stranger comes up to say “hi” to you. If the trainer is missing certain skills, this can also slow down or disrupt training. 2) The shaping steps are too big. Trainers who are new to shaping often make the mistake of trying to ask for too much new behavior at each step. The trainer moves from Step 1 to Step 2, not realizing that Step 2 really should be Step 5 and that she is missing three additional intermediate steps. If the jumps between the steps are too large, the animal won’t be able to figure out what to do next, which can lead to confusion and then frustration. 3) The trainer doesn’t have an effective reinforcer. For shaping and positive reinforcement training to work, you will need a reward that excites your dog and that your dog is willing to work for. You will lose your dog’s attention if there’s nothing worthwhile in it for him. Similarly, there are sometimes “competing reinforcers” in the environment — things that are just way more interesting to your dog, even though you have something that is normally a valuable reward. For example, you might have your dog’s favorite jerky treats, but suddenly two squirrels start chasing each other in the big tree right behind you. Training (and especially training new behaviors) becomes difficult if you don’t have a worthwhile reinforcer or when you have other things competing for your dog’s attention. 4) The trainer is shaping in the wrong direction. Sometimes in shaping, everything seems like it is going along really well, but then everything seems to fall apart. What can happen is that the behavior “looks” correct initially, but the dog is actually learning the wrong behavior. For example, you think that you’ve shaped you dog to go sit on a carpet square that is positioned in front of you, but really he’s just learned to go sit several feet in front of you. Once you change positions, everything falls apart because he hasn’t realized that the carpet square is part of the behavior. Something similar can happen if the trainer uses prompts or lures incorrectly. The animal “appears” to be doing the correct action, but the animal has only learned to respond to the prompt or lure. 5) The shaping plan needs to be longer. What about a dog that can do a perfect down stay in the living room, but can’t do it in the backyard or anywhere else with distractions? Or, perhaps a dog that can sit calmly when the owners come home, but can’t when visitors come to visit. This isn’t the fault of shaping. It just shows that the shaping plan didn’t have enough steps. The training plan needed to be extended, to teach the dog additional variations of the behavior or to teach the dog to do the behavior in additional places or settings. (In other words, the shaping plan needed to include more of what dog trainers call proofing and training for generalization.) The trainer should add additional steps and continue the training. You can largely avoid this issue if you think carefully from the beginning about all of the conditions where the dog will have to perform this behavior and then incorporate these relevant variables and conditions into your training plan. 6) The dog has physical limitations that make learning difficult or even painful. Sometimes the shaping plan is good on the surface, but the dog can’t physically do what you are asking. In some cases, the dog might need additional physical conditioning to build muscles and flexibility, before he can advance through the shaping program. In other cases, the dog might have physical limitations that make the behavior very difficult or impossible. “Sit pretty,” whee the dog sits and the raises both paws up in the air, can be very difficult for some dogs, depending on the dog’s balance and the way the dog is built. In traditional approaches to training, if the dog struggles to learn a behavior he is labeled as slow, unintelligent, or unmotivated. Some trainers might even tell you that the dog is stubborn or spiteful and is purposefully not learning. However, a more useful approach is to consider instead that the dog just can’t understand what you are trying to teach. Usually, if you spend some time analyzing and revising your plan, you’ll be able to make some changes so that your dog can successfully learn the behavior you are trying to train. If you’re brand new to shaping or if you’re really stuck, I recommend finding a qualified professional trainer who can mentor you and help you and your dog learn more about shaping. What behaviors will you train using shaping? That was quite a lot of words! I’m impressed if you’ve stuck around this long. If you have, I’d love to know what behaviors you have taught using shaping and what behaviors you plan to teach next to your dog (or other critters). Don’t be shy, leave a comment below! I love the idea of shaping, especially with younger dogs. With the potential of bringing a young pup into our home in a few weeks, I’m reading everything I can find on training! Thanks for the great information! Puppies are fun, but they are certainly a lot of work! Good luck with the new little one. Let me know if you have any puppy training questions and I will try to help, if I am able to long-distance. I try to shape almost everything. Right now, we’re in the middle of trying to shape a handstand and it’s slow going! I’ll have to take a look at your checklist. Sounds like fun! I would love to see the final behavior once it is trained. Thank you soooo much!! I think this will help with many things. I am currently working on strenghtening “go to your mark”… and plan on having fun with the dogs on other behaviors… You Rock! I’m so glad you liked the post. I hope you have lots of fun training with your pups! This is such an interesting concept! And it makes a lot of sense. I’m glad you enjoyed the article. Let me know if you have any questions about training or shaping! Thank you so much for this opportunity of learning to teach my dog the correct and logical way. This has been so much fun for me and I’m sure it will be just as rewarding for my girl Stella. We have been practicing on our own to do tricks and retrieve but this makes great sense and will be most helpful in advancing good behavior and focus. Most of all this is easy for ME to understand. Some videos assume that everyone is a trainer and they know exactly what to do. These videos show exactly how to do it from a novices viewpoint, explaining the reasoning behind each movement. I can’t wait to get started. I’m glad you enjoyed the videos, Jeanne. It was difficult deciding which ones to include! Hope you have lots of fun shaping new behaviors with Stella! Mary, I love the way you write and clarify things. Especially enjoyed the clip with Maasa and Jackson. Is it okay with you and Maasa if I reference that clip in the book I’m writing at the moment called The Eight Leading Positions? It is about the various orientations we use when we ask our horse to do something, and how significant our body orientation can be as part of the signal we are giving. Hertha, I imagine it is fine, but let me put you in touch with Maasa so that the two of you can chat further! I trained our dog to stop drop and roll then play dead on the “Bang” command years ago and she still does it! It took a week or so to train and I really didn’t know what I was doing but now understand what I did was a variation of this shaping. Thanks for taking the time to teach others! This a very nicely written article. I have done lots of shaping with my dog. I have done agility, obedience and trick. I just held an agility class that started with clicker section. This helped a lot people to understand training with shaping. 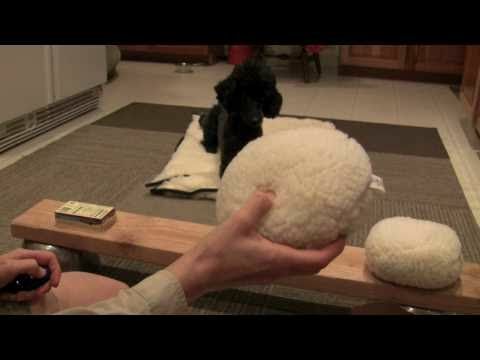 Group tought the dog to shut door and do tricks with balance pillows. Nice start before we started to work on “the real stuff” for agility. I have tried some shaping with horses too. I would love to her hands on training with horse training. Our newest trick on the way is freestyle position and left and right turns in RDW in agility. I’m glad you enjoyed the article! Thanks for stopping by and leaving a comment. Shaping that most maligned sport Conformation. Two behaviors in the art of stacking. Stepping forward only the front feet, back legs stationary. Also adjusting only the back legs using a side pressure prompt. How? It was what you referred to as using a previous skill to shore up the initial shaping. Here I started with the pot. In the first case onto the pot and step off the pot . Prodigious repeats and sharp timing using the clicker. For intricate steps always the clicker. For the rear control, on the pot and reinforcement for any correct rear adjustment on requested side. Eventually a lower and again a lower pot. Never rushing each shaped skill step and retracing the learning curve if skills weaken, and of course not getting sloppy about maintenance. For a dog that will not hand stack this gives one options. Eventually down to the naked floor. Marvellous precise fun! Thanks for commenting and sharing about your experiences with shaping. I definitely agree with you that shaping is a lot of fun !! We are in the process of adopting a blind Great Dane from a rescue. He is a lovely dog but is a bit too excited by food and other dogs right now. I have heard clicker training and shaping are good for blind dogs. Do you have experience with this or know where I might find some resources specifically for blind dogs? Thank you so much. I would suggest that you start with Miki Saito’s site, Blind Dog Training (http://blinddogtraining.com). It is full of great articles, videos, and other resources about training blind dogs using clicker training and positive training techniques. Miki is also very friendly, and I’m sure she’d be able to answer any questions you have or direct you toward additional resources. Also, if you can let me know where you are located, I’m happy to try and help you find a positive trainer in your area. I’ve always been rotten at shaping. My old man being literally the epitome of food hound. He could work 8 hours straight as long as good was still around. Puppy not so much 15 minutes tops and his motivators change like the weather here. So I’m getting better cause he’s making me. We are working on a retrieve now. Hopefully maybe getting him to turn off lights next. We shall see open to fun trick suggestions. He’s got an amazing “stay” (we don’t say stay with him found its worked amazing but need to tune up his distance handling again) but that wasn’t really done through shaping I don’t think. Really don’t know what I’d call it. Thanks for stopping by and leaving a comment! I’m glad your having fun doing lots of training with your puppy. It sounds like both of you are learning more about shaping together. Mary, I would be very interested to learn more about services to train dogs with paralyzed back limbs (young pups, but maybe also older little guys). Is that something you do? Or maybe you know some resources or references? It would be lovely if you could guide me/us where to look. Thank you! Thanks for stopping by and leaving a comment. I actually do not have much experience working with paralyzed dogs. So, it is hard for me to comment about this. If you do have a chance to do some training with a dog with paralyzed back limbs, I would love to hear about your experience! Thanks, Marilyn! I’m so glad to hear that you enjoyed the article. Thanks for this-very helpful as given me a light-bulb moment as to where I am going wrong with trying to teach my 2 year old Kerry Blue terrier Magnus “match to sample”. I can see I have tried to teach step 5 rather than step 2 and that’s why his success rate is averaging about 50 %. I had given up as was getting very bored with it (though Magnus wasn’t). Magnus has won obedience and talent classes and this trick would look so cool! He loves to work and I enjoy teaching him but not “match to sample” as I thought he would never “get it”. Back to the drawing board. Sometimes, it does help to go “back to the drawing board” when a shaping plan isn’t working. I want to shape a “front” for use in rally and other obedience classes but can’t quite figure out how to do it. I do have a small platform (8x10x1/2 inch) and i do know how to use a clicker but can’t figure out how to help my 1 year old springer to figure it out! Thoughts? I think the platform will definitely help, because you can use it to limit your pup’s movement and help her find the correct position. You will probably want to teach her how to get on and off of the platform separately, before you start using it to teach the front position. I do not participate in rally or obedience, so you may want to look at how other trainers are using clicker training and platforms to teach “front” and other obedience behaviors. Michele Pouliot has several great DVDs about using platforms for training. And, Hannah Branigan is a brilliant trainer when it comes to obedience. She has several DVDs and an online course. I’ve been shaping without really understanding what I was meant to be doing. This article brought everything together and made it really clear, the penny has finally dropped.